The market saw a steep ascent from the depths of last week. The Baltic Capesize Index (BCI) 5TC opened on Monday at $5,099, although by Friday’s close most gains were lost, and it finished up at $5,737, a modest gain of $638. Improved sentiment stemmed from Atlantic-tightness combined with an open Colombia coal arbitrage. This in turn provided an influx of fronthaul cargo with minimal candidates, a much-needed injection in recent market times. The improved sentiment lent itself to escalations in the Pacific market. This led to West Australia to China iron ore cargoes lifting from $4.60 per metric ton (pmt) to above $5.00. The week ended on a wimper as the Pacific remained firm to holding, while the Atlantic rates and sentiment softened as the arbitrage closed. The ice premium season is also coming to an end at the beginning of May. An uneventful week started very slowly in the Pacific, partly due to Coaltrans in Shanghai. Despite increased activity in the second half of the week, spot rates have drifted lower. Coal into India remained the main driving force, with more grains from the North Pacific also evident, but the tonnage profile remained in Charterers favour. There has been increased period activity, with several modern Kamsarmaxes fixed for five to eight months around $11,500. Two new buildings agreed index-linked deals, with an $11,000 floor plus profit share for two years apiece. Several similar ships concluded on one year deals too and it appeared to be the same Charterers taking multiple ships in each case. In the Atlantic, fronthaul grains continued to support the market with a constant flow of fixtures being reported, although rates again softened slightly during the week. Sources suggested tonnage on the North Continent had tightened, but this hadn’t yet been reflected in reported trades. The Baltic Supramax Index (BSI) continued its downward trend during the week, however, some areas showed more resilience than others. 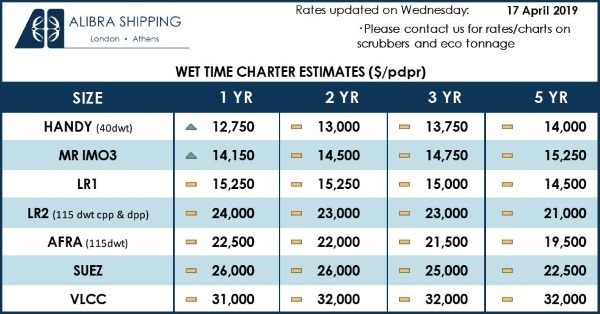 Period activity remained subdued, but a 58,000dwt vessel open Dubai was fixed for a short period at $11,500. From the Atlantic the only bright area was East Coast South America, with transatlantic runs seemingly at healthier levels. A 57,000dwt ship concluded delivery Recalada trip to Algeria at $17,000. Otherwise fresh enquiry lacked impetus, especially from the Continent-Mediterranean, with 53,000-tonner fixed delivery central Mediterranean, redelivery Arabian Gulf, at $11,000. In Asia, a similar situation saw a build-up of tonnage in the north. From Southeast Asia it was finely balanced. A 56,000dwt vessel, open Singapore, fixed a trip redelivery India with sands, at $9,000s. The Indian Ocean was active, however rates remained steady. A 55,000dwt ship fixed delivery Port Elizabeth, redelivery Far East, at $11,400 plus $140,000 ballast bonus. A week of continuous falls in both the Atlantic and Asian markets. Negative sentiment was evident and gained pace throughout the week. A 34,000-tonner open Veracruz was fixed basis Southwest Pass for moving petcoke to Mexico at $6,500. A similar sized vessel, open Savannah, was fixed for moving grain to Ireland at $6,000 with the same delivery. From East Coast South America, a 35,000dwt ship was paid $14,000 for delivery Recalada to Australia, and a 31,000dwt vessel was booked at $10,500 from Praia Mole to Rio Grande for a coastal run. 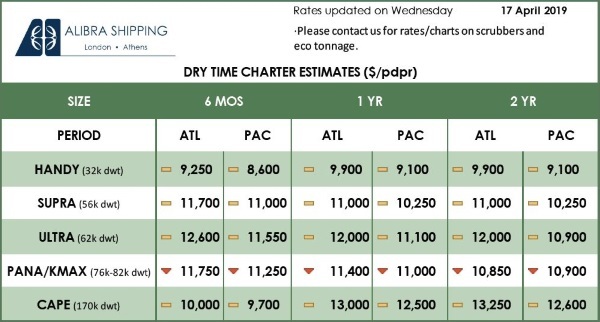 A trip from the Black Sea to Otranto paid approximately $6,000 on a 35,000dwt ship, basis delivery Canakkale, and at low $5,000s level for a trip to East Coast South America with a steel cargo on a 37,000dwt vessel. From Asia little was reported and again rates remained under negative pressure, with a lack of fresh enquiry.